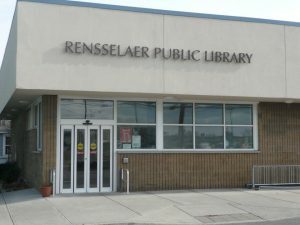 The Rensselaer Public Library has been around since before the city was founded (as the Bath-on-Hudson library). It received its absolute charter in 1904. The library has been in many locations, including school #2 and Broadway. It moved into our current location on East street in November of 2009. The Library Board meets the first Monday of every month (barring holidays) at 7 PM. The meeting is open to the public. The Friends of the Library are looking for members. Please call the library or check our online calendar for the next meeting time. Duties include shelving, running the check-out desk, helping patrons with the computer and copier, and answering the phone. Candidate must have computer skills, strong customer service skills, work well with children, and understand the Dewey Decimal system. If you would like to apply for a job at our library, please fill out a Rensselaer County Civil Service application.